Gardeners and lovers of flowers alike love columbines. This wild version called Eastern Red Columbine is also known as the American Columbine. The plant grows wild all the way from Canada to Florida and from Texas to the Dakotas. One can easily see why it is so loved. The flowers are very showy, with a bright strawberry red bell shape that has a bright yellow stamens. It is sure to attract butterflies and hummingbirds. 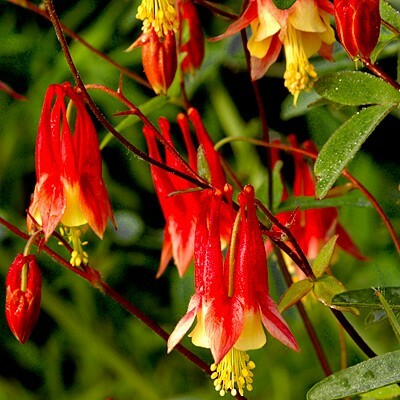 Click here to purchase Seeds for Red columbine from Outside Pride on Amazon. How to grow: Start from seeds. Foliage: Remains attractive most of the year.